Pete Buttigieg has surged to third place in a new poll of Democratic presidential candidates, ahead of Kamala Harris, Elizabeth Warren and Beto'Rourke. Buttigieg had 0% support in Emerson's January poll, which was conducted just after he formed an exploratory committee. Harris, a senator from California, had 10% support in the Emerson poll - which had a margin error of +/- 6.2% - while Warren of Massachusetts was in fourth place with 9%. Beto O'Rourke, the former congressman from Texas who has captured the attention of the public and the media with a combination of relentless charm and non-committal policy positions, was backed by 5% of likely voters. 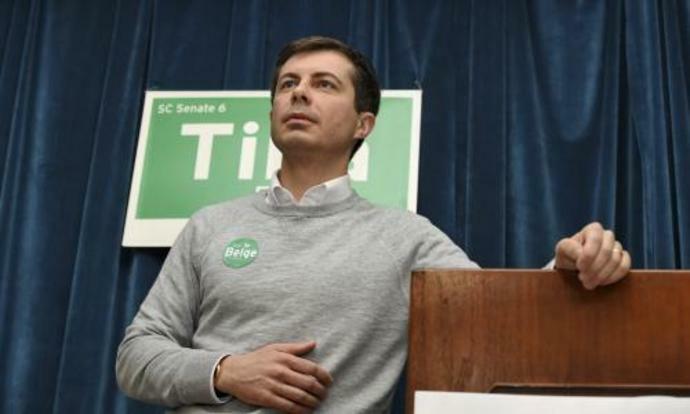 Were he elected, Buttigieg would be the first openly gay president. In South Carolina on Saturday, he told voters his marriage existed "by the grace of a single vote on the US supreme court", and said it had brought him closer to God.